Don’t worry, I’m not starting that old argument again but rather using it to highlight an issue that our industry is about to face: the hijacking of another ill-defined, popular term purely to sell even more generic beers to the unsuspecting drinker. While brewers, bloggers, bar staff and your informed drinkers were arguing over what Craft actually was, the marketing people moved in, slapped it onto the labels of mass-produced bland beers, and conned many, many drinkers into thinking that the pretty mediocre stuff in the bottle with the fancy label is what everyone’s been raving about. And the average drinker couldn’t see what all the fuss was about. This time, the term is ‘Heritage’. Which, given that I specialise in it, is something close to my heart, and I’d like to see this one nipped in the bud quickly. Obviously then, the thing to ask is “What is ‘Heritage Beer’?” In short, it’s a recreation of a beer from our brewing heritage. Historic brewing is a whole other thing, but I’m going to include it in here for the time being to make it easier to determine a start date. So, when does beer stop being a Heritage Beer and start being modern? A nice arbitrary time is around the American Prohibition era, or up until the Second World War. Some people may well justifiably argue that it was the start of the First World War as that’s when the British government really started messing about with the industry, but I’m going to be generous and say the start of the World War II, because that then includes lost styles such as Government Ale. So a Heritage Beer is anything from before the Second World War? Unfortunately, it’s not as simple as using a recipe predating 1939. Was an actual brewing ledger recipe used to create a Heritage Beer, or does it simply mimic what the brewery believes to be the right sort of style? In general, heritage beers put all their hops in at the start of longer boils for higher amounts of bitterness that they know will fade over time as the beer ages, rather than using the modern technique of putting hops in at the end for lots of aroma as the beer is drunk fresh. Just switching the point at which you add your hops doesn’t make your recipe a heritage one though, it just makes it more bitter and less aromatic. Grain bills used to be a lot more complicated than for modern beers and different sorts of brewers invert sugars were widely used. The next thing to consider is the ingredients themselves. Did the brewery use original ingredients, or did they replace them with modern equivalents? Crisp Maltings recently brought Chevallier back from obscurity. From a mere handful of seeds, this grain from 1824 is now commercially available again, and it’s unlike any modern grain. You can’t rebrew a 200-year-old recipe using Extra Pale Ale malt and say “That’s how it used to taste.” You can get an idea, but it won’t be exactly the same. Recently Greene King from Suffolk released two beers that they say are inspired by heritage recipes, and they’ve used Chevallier malt and traditional hops. It’s not an original recipe from their ledgers, it’s based on them and uses heritage ingredients. Just using some original ingredients such as a Chevallier malt base but using a modern aroma hop such as Amarillo isn’t really heritage either. What about brewing techniques? There are folks such as Ron Pattinson who spend a lot of their time poring over old brewing ledgers, not just to get the recipes but also to research lost brewing techniques. There’s a lot more to it than just switching hop additions about. Labour used to be cheap and ingredients used to be expensive by comparison, so methods were developed that worked to that situation. Multi-stage mashing took a lot longer but got far more sugars out of those heritage malts, and at a time when beer was taxed by the amount of malt used rather than the amount of alcohol in it this was a very important saving. Tests in reusing spent aroma hops for the first bittering addition of the following brew have shown that hop bills could be cut by between a third and a half, further reducing the costs of production. While using these techniques doesn’t mean it’s a heritage beer you’re producing, it does start to make it more affordable to do so. Unless you have staff to pay and you’ve not automated the equipment, then it starts getting very expensive as a brew day can easily increase from five to twelve hours. There were also unintended techniques that we’re still finding out about. For example, recently Gypsy Hill Brewery of London put some IPAs into wooden barrels on river boats to mimic the movement that beers shipped to India would have experienced, focussing on the prevention of pellicles forming and the beer’s interaction with the wood itself. Lastly there’s branding. This has nothing to do with brewing methods or the beer itself, but it is handy to use to let people know that what they’ve got in their glass is something a little special. That this isn’t your average, run-of-the-mill beer, this is a piece of living history you’re experiencing. Recently Tennent’s released some special edition bottles. The beer inside these was their normal lager, but they’d changed the labels to be inspired by their brewing heritage. Nothing different about the beers, just special edition bottles. Beers that are Inspired By aren’t bad, these are good! Mostly. If people are looking at our brewing heritage for inspiration for the beer that’s a good thing. If there’s looking at it purely for inspiration to sell you the same old same old, then that’s a bit of a con. Are we seeing Heritage becoming the Next Big Thing in beer? Maybe not the next big thing, but it’s certainly being used to promote beers. Guinness have their Brewer’s Project where they’ve been releasing beers whose recipes have “origins” in their old brewery ledgers. 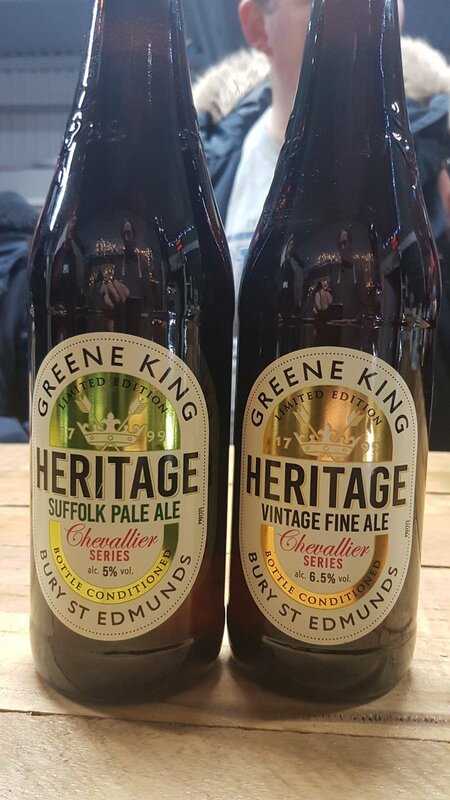 Tennent’s have their heritage inspired labels, Greene King have their limited edition Chevallier series beers. Timothy Taylors have a range of beers with heritage labels with recipes designed for modern palates with a nod to history. 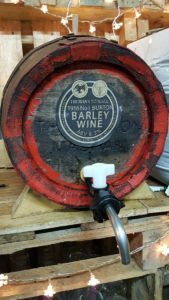 Cheshire Brew House have been brewing beers for a few years now with heritage ingredients, Little Earth Project have set out from their start to reproduce barrel-aged bretted heritage beers, and Gypsy Hill are experimenting with the effects of the heritage ageing and delivery process. Truman’s have reproduced a couple of beers from their own ledgers, and have also brewed a collaboration with us where we’ve used the ingredients of the time to recreate their 1916 Burton Number 1 Barley Wine. We’ve also done a fair few more heritage brews, including the beers for our Heritage Barrel Ageing Programme. I’ve almost certainly missed some breweries here, but as you can see for both large and small there is a growing focus on heritage brewing. 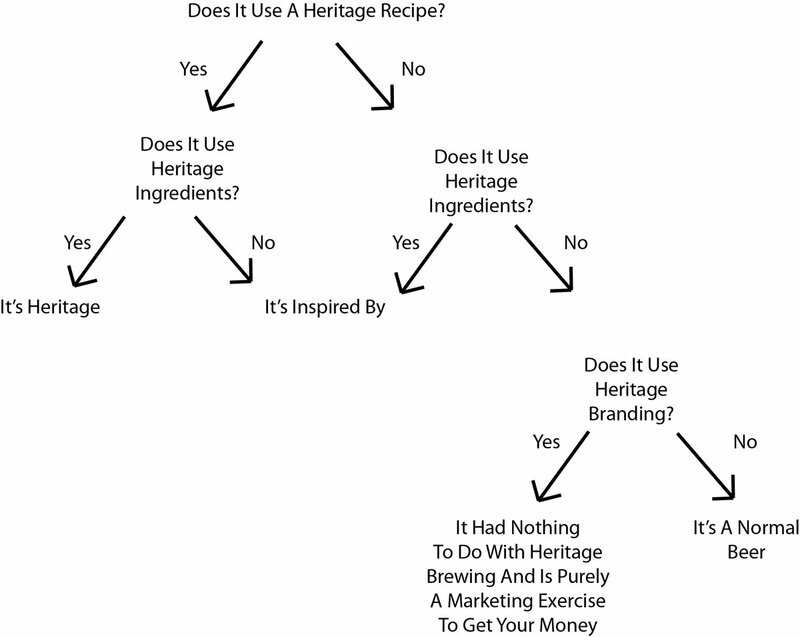 So please, when you see a bottle in a shop, or a pump clip on a bar, have a quick think about whether the beer you’re buying is actually a Heritage Brew, or if it’s just a new marketing phrase someone’s slapped on there to get your cash.